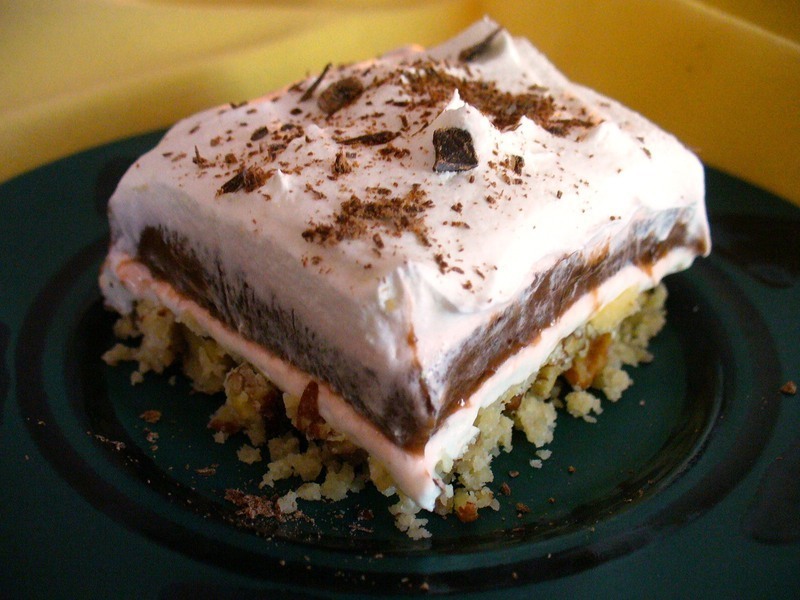 Years ago a friend gave me this recipe saying it is as the name says, truly “Good Stuff.” Layers start with a pecan crust, then a cream cheese filling, chocolate pudding layer and a whip topping. 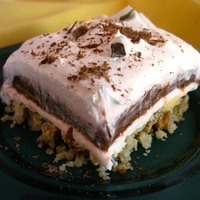 As a dessert it’s a real “looker,” but the taste tells you this is one luscious “icebox” cake. The name doesn’t do this one justice ~ it’s way beyond ‘good stuff!’ I’d even borrow Buzz Lightyear’s mantra here, that this dessert is “....to infinity and beyond!” Another bonus is it can easily be made into a reduced calorie version by using reduced fat cream cheese, sugar-free pudding mixes, 1% or skim milk, and light or sugar-free whipped topping. Mix together pecans, flour and melted butter. Press evenly into a 9" x 13" baking pan or dish. Bake 20 minutes until lightly golden brown. Cool on wire rack to room temperature, then chill until ready to add cream cheese layer. Beat cream cheese with powdered sugar til well blended. Fold in 1 1/2 cups of the whipped topping. Spread mixture onto cooled crust and refrigerate while preparing pudding filling. Combine chocolate and vanilla pudding mixes with cold milk in mixing bowl. Mix 2 minutes until well blended. Spread mixture evenly on top of cream cheese layer. Smooth enough of remaining whipped topping over top to make a layer about 1/2 inch thick. Refrigerate 4 hours or overnight before serving. Sprinkle servings with any of the optional toppings. Absolutely delicious. Smooth, creamy, and rich tasting (but not overbearingly rich). I can usually control my intake of desserts to just one serving, even tasty ones, but this is one that I found almost impossible to refrain from enjoying a second and third helping. Sounds delicious. I am on a low carb diet but I can't resist desserts like this .